Before I get into the comparison proper, I should make sure that you’ve read my reviews of the two games, DOOM and Adrenaline, so you can see where we’re coming from. Plus it gives us a few more hits on those pages for us to justify our worth as human beings. And if you’re feeling adventurous, you should probably listen to the respective podcasts too. Read them? Good. Now, on with the face off! Going on the retail prices, with Adrenaline having RRP £47.99 and DOOM having RRP £73.99, it’s pretty easy to see where this is going. The prices I actually paid were £39 and £59 respectively, but even then with a price difference of about 20 quid, this one is quite easy to conclude a winner on: Adrenaline. And by this I mean, how many folk can play. Max of five each – score draw. However, Adrenaline has a minimum of three, whereas DOOM can cope down to two. One point to the Demon spawner! Being a fan of complex, hefty games you’d think I’d be more tolerant of set-up times. To a certain extent, I am, but Fantasy Flight Games’ are somewhat “faffy” and heavy on the set-up times even for my tastes, despite me being a fan of their stuff. DOOM is particularly set-up heavy as you need to build custom decks every time you play and build the map. 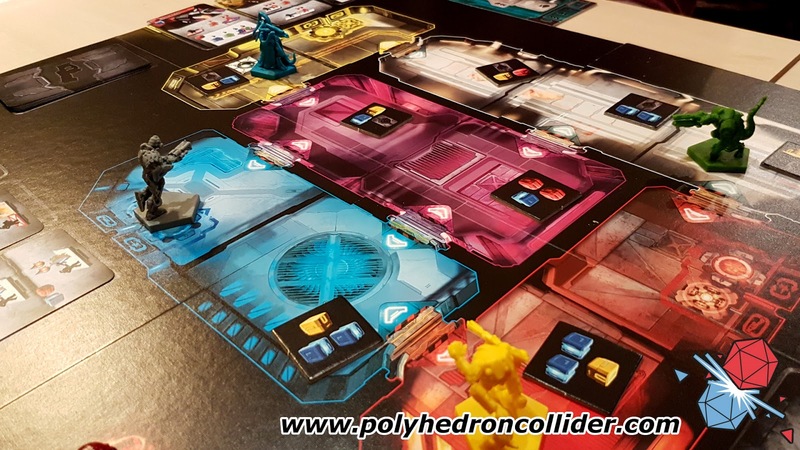 Adrenaline is much more streamlined – get each deck out, shuffle, put on board, give out each player’s counters and away you go. Unreal Tournament’s cardboard cousin wins this one by a good 10 minutes. Depends what you’re going for here really. Both games fill their time slots well and neither feels like you’d be better off attending a three-day accountancy seminar, but appreciating that a lot of people have busy lives, fast paced shooty fun with the longevity of a drunken fumble behind the bins is an attractive quality. Adrenaline bags the “Two pumps and a Squirt” award for fastest finisher. Neither game looks like it’s been fashioned from sack cloth and lollipop sticks and they’re both good looking, well made and great to the touch. However, the detail on the miniatures in DOOM is really something else, especially the Cyberdemon. That’s a painter’s dream although if I tried with my current level of skill, it’d likely end up looking like a drunken Picasso. So DOOM wins this one on the grounds of it’s a better place to stick your brush. 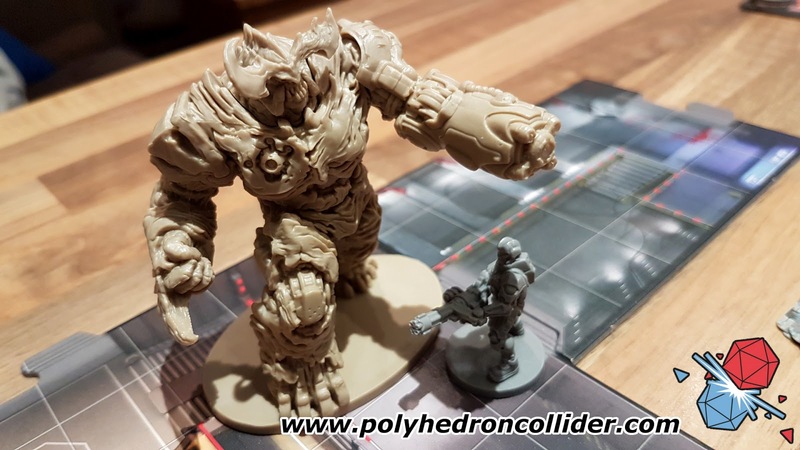 Fantasy Flight Games have a reputation for not being the lightest when it comes to rules and they’re true to form here, although DOOM is slightly lighter than a lot of their offerings. 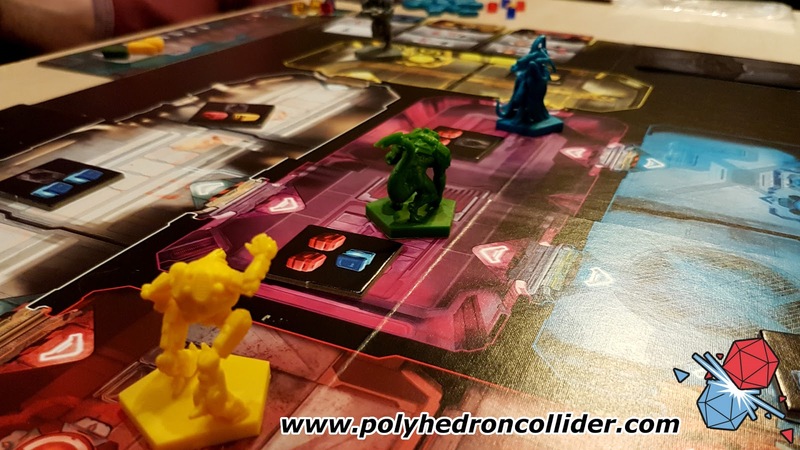 Adrenaline on the other hand is a very straightforward game to learn and teach; it takes something like 5-10 mins to get through the learning session before you’re grabbing guns and perforating your opponents. In that timescale, you’d be lucky to have even sorted the decks in DOOM. Czech Games Edition grab another point here. 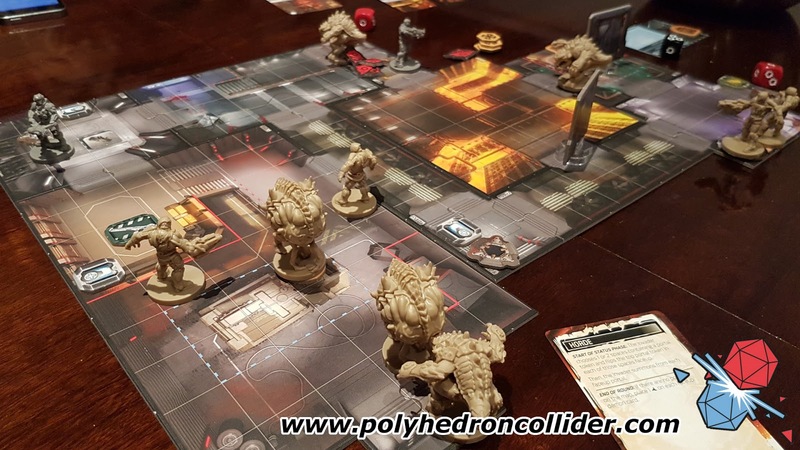 It really depends on your point of view – Adrenaline doesn’t have dice and DOOM does. Whilst the former really makes the combat much easier and fluid, it’s not as representative of what happens in a shooting match, especially if you have the aiming abilities of a blind man after too many cups of coffee which I can attest to, based on my own performance in Unreal Tournament online. I’m going to give this to DOOM for being a bit more unpredictable and providing a few “OMG” moments during the game. Based on the RRP, this category is much more difficult to define as both games are priced quite well for what you get. 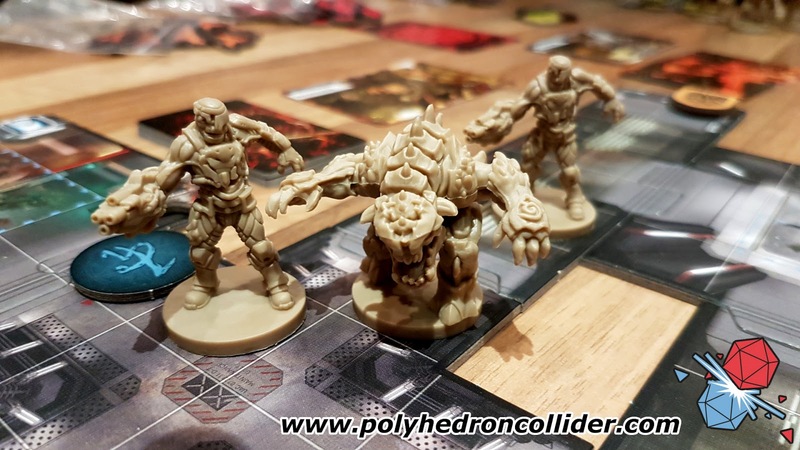 Fantasy Flight Games are usually never cheap, but what you get does usually justify the price. Adrenaline is also good price, a little cheaper and you get quite a bit in the box so it’s tough to choose a winner here. Based on what I paid the same is true, but I think DOOM just noses it here for having a bit more bang for its buck. Another tough one as it really depends on what you like. DOOM is much more configurable than Adrenaline due to it having more tiles than a bathroom warehouse and you can define your own campaigns. 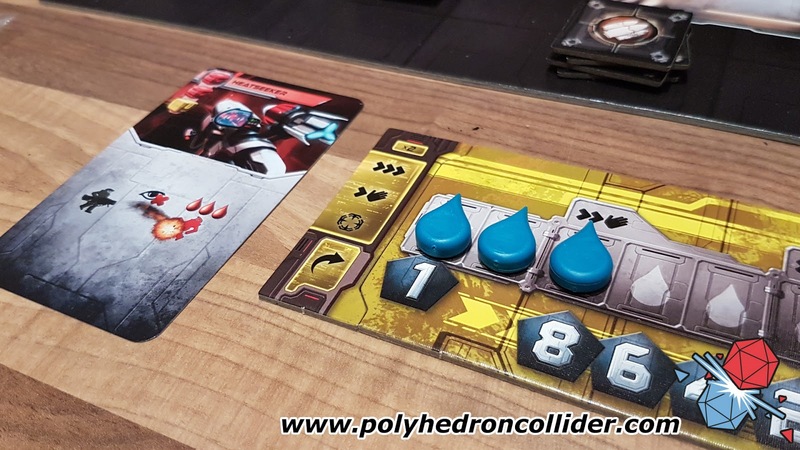 Adrenaline is not as versatile, but it doesn’t need to be with quite a few game modes squeezed into the double-sided boards. Am I likely to be playing one more than the other after a year? Probably Adrenaline as it’s a little more unique than DOOM, but it’s a close call. It would appear that Adrenaline is the slight preference over DOOM, mostly down to price, simplicity and time spent playing. 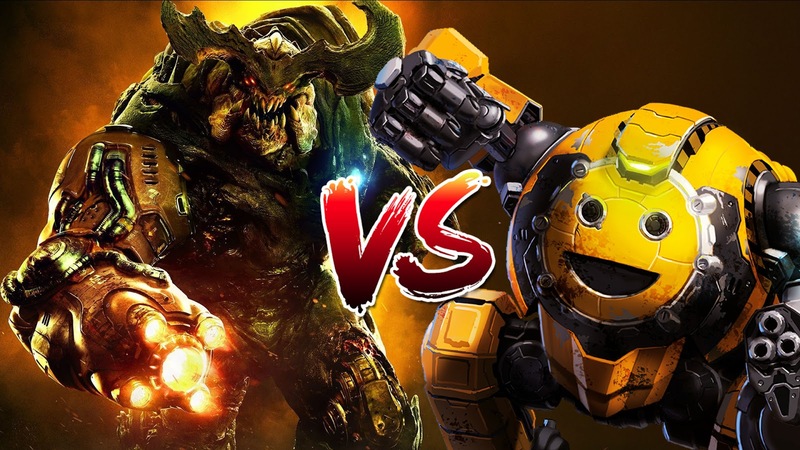 Now of course, some of the categories are a little subjective and could have gone either way – indeed, being torn on the “game I’d be playing after a year” category, it could just as easily gone DOOM’s way and I’d be telling you to go and buy the one with hell-spawn in over the one with a smiley robot. So I’m actually going to call a draw – both games are really great and have their unique appeal. They’re also very different so owning both won’t mean you’d be torn over which one to play like with Rock Band or Guitar Hero. Isn’t it nice when we all get along?